KENTON — Gas prices last week were lower than they have been in 75 days with even lower prices in the following weeks, according to Patrick DeHaan, head of petroleum analysis for GasBuddy. As of Monday afternoon, Hardin County had the lowest gas prices in the Greater Lima Region three weeks in a row at $2.55, which is 27 cents less than the national average. 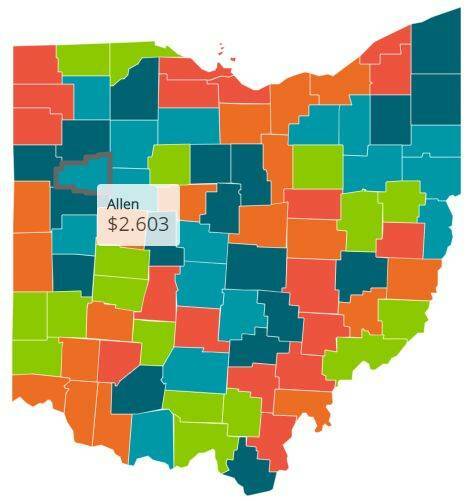 The county with the second lowest average gas prices is Shelby at $2.57, followed by Allen at $2.603, Hancock at $2.607, Putnam at $2.64, Van Wert at $2.66, Auglaize at $2.69, Logan at $2.73 and Mercer at $2.74. On Monday afternoon, the average price of a gallon of regular gas in Ohio was $2.69, while last week’s average was 2.79. Sunday’s gas prices was consistent with Monday’s average. Last month’s gas prices were 6.5 cents higher than this month’s. Gas prices are 48.3 cents higher than last year. Gas prices in the Lima region have decreased 16.3 cents since last week, according to prices reported to GasBuddy.com. Sunday’s gas prices were 8.3 cents higher than Monday’s prices. Regional gas prices are 9.2 cents higher than last month and 52.2 cents higher than last year, according to GasBuddy’s daily survey of 5,345 gas outlets in Ohio. The national average has gone down 4.4 cents from last week at $2.80. Sunday’s gas prices was consistent with Monday’s prices. Gas prices have gone up 55.3 cents since last year and are down 1.64 cents since last month. Oil prices have been affected as Libya has been resuming oil exports,when has fallen a little under $68 per barrel last week, according to DeHaan. Prices last week were significantly lower than two weeks ago, when oil prices were $75. DeHaan believes that there may be greater oil production from both Russia and Saudi Arabia, leading to fears of a smaller supply.